Your child's potential is limitless. We do not believe in "false" hope. While we certainly cannot predict what any given child will achieve, we do not believe any child or parent is served when others decide in advance what that child will not achieve. No parent should ever have to apologize for believing in their child. We don't apologize for it either. It is a relational, interactional disorder. At its core, Autism is a neurological challenge where children have difficulty relating and connecting to those around them. Most of their so-called behavioral challenges stem from this relational deficit. That's why our dynamic, enthusiastic, play-oriented methods focus so extensively on socialization and rapport building. Of course, we want you to enjoy your child, but, even more important, we want your child to enjoy you. Many traditional modalities "go against the grain" by sitting a child down and endeavoring to teach through endless repetition. Instead, we uncover each child's unique motivations and use these to teach our children the skills they need to learn. That way, we have the child's willing participation, as well as a longer attention span and increased retention and generalization of skills. Your child's "stimming" behaviors have important meaning and value. We have a deep acceptance of and respect for our children. That enables us to reach across the chasm separating their world from ours by doing something bold and unusual. We join, rather than stop, a child's repetitive, exclusive and ritualistic behaviors. Doing so builds rapport and connection, the platform for all future education and development. Participating with a child in these behaviors facilitates eye contact, social development and inclusion of others in play. The parent is the child's best resource. Although we have had the opportunity to work with many extremely supportive, caring and helpful professionals, we have seen nothing yet to equal the power of the parent. No one else can match the unparalleled love, deep dedication, long-term commitment and day in, day out experience with their child that parents possess. Therefore, we seek to empower parents. In fact, we spend much of our time and effort providing parents with attitudinal training, listening to what they have to say, and providing them with the skills training they need to help their child like no one else can. We help parents to be confident directors and teachers for their own child's program. Your child can progress in the right environment. Most children on the Autism Spectrum are highly over stimulated by a plethora of distractions that most of us do not even notice. We show you how to create an optimal learning environment so that distractions are eliminated and interactions are facilitated. In addition, this work/playroom drastically reduces the push-pull control battles that inhibit progress and useful interaction, thus paving the way not only for progressive learning, but also for a sweetness of interaction that parents yearn for. Parents and professionals are most effective when they feel comfortable with their child, optimistic about their child's capabilities and hopeful about their child's future. Oftentimes parents are given prognoses that are frightening and negative. They are told what their children will never do and can never have. We do not believe that anyone has the right to tell a parent what their child cannot achieve. We help parents focus on their attitude and reclaim their optimism and hopefulness. We help them to see the potential in their children and then "go for the gold." From this perspective, we have seen, all things are possible. Additionally, caring professionals are not often given the resources, guidance or support that they need to help the children that they are working with. We understand the pressures that many professionals deal with and offer a unique attitudinal perspective that allows you to feel both re-energized and armed with excellent tools to help your students. The Son-Rise Program® can be combined effectively with other complimentary therapies such as biomedical interventions, sensory integration therapy, dietary changes (gluten/casein-free), Auditory Integration therapy and others. The Son-Rise Program® is designed to be customized to each child's needs. Having worked with thousands of children who have had a wide array of challenges, we have observed that when additional therapies are included, and applied using The Son-Rise Program® principles, the intervention is even more effective than when used individually. 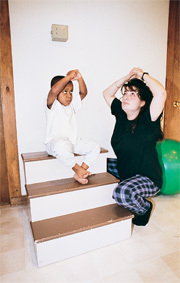 Some approaches, which contain principles and techniques which are contradictory to our approach, have been found to undermine the effectiveness of the program and confuse the child. Our staff helps each family determine the most effective intervention for their child.